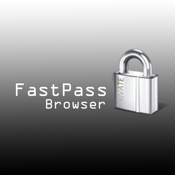 FastPass Browser allows anyone instant secure access to multiple private browser sessions with fast auto-lock abilities. - NO SETUP! Simply enter a 4 digit access code to initiate a secure, private browser. - Each FastPass code entered creates a new, individually isolated browser. Continue any session by entering the same FastPass code on the lock screen that was used to start it. - Stay logged in to the same sites with different user accounts. Personal, business, and private browsing all at the same time secured by different FastPass codes. - Auto-lock by waving hand over iPhone sensor when someone interrupts your private session. Auto-lock when in background mode, when iPhone is turned upside down on a table, or when upside down going into your pocket. - Confronted by your boss? Type a different FastPass code and show him you were just checking the weather, or using the company intranet! - Never worry about a friend hijacking your Facebook session when you leave your phone on your desk!